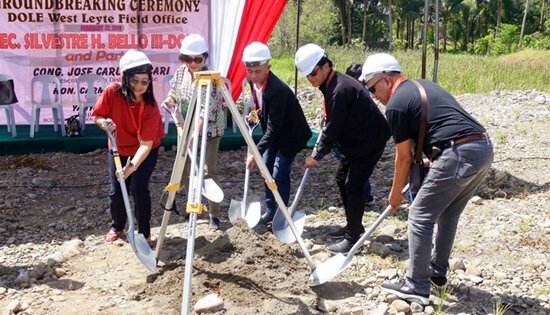 ED Maglunsod, DOLE Officials and Mayor Carmen L. Cari of Baybay during the groundbreaking Ceremony. BAYBAY CITY – A groundbreaking ceremony for the future office of the Department of Labor and Employment in the Western part of Leyte was held last 22 February 2019 at the New Government Center, this city. The ceremony was graced by NMP Executive Director Joel B. Maglunsod, DOLE Region VIII Director Yahya A. Centi and Baybay City Mayor, Honorable Carmen L. Cari. The 500 square meter lot was donated by the LGU Baybay through the efforts of the good city mayor and with the active support of Congressman Jose Carlos L. Cari of the 5th District of Leyte. Mayor Cari, in her welcome remarks, said that they really intend to donate parcels of lot to government agencies not just for the good of the recipient agency but ultimately for the benefit of the constituents of the Western Leyte especially Baybay. “I am very glad that sooner or later, DOLE will be with us here in Baybay City. This lot donation will be for the welfare not just of the people of Baybay but for all the people of West Leyte. I know that DOLE will make good use of this lot for all the people we serve that is why there were no hesitations on our part at the onset,” said Mayor Cari. NMP Executive Director Joel B. Maglunsod, representing DOLE Secretary Silvestre H. Bello III, read the message of SecLab. On a personal note, ED Maglunsod also congratulated DOLE Region VIII for having been awarded a lot where the future building of DOLE will rise. “Let me congratulate DOLE Region VIII under the leadership of Director Centi for this milestone. As part of the DOLE Family, I am more than happy to be witness to this significant activity for DOLE and LGU-Baybay. Nothing but good words and appreciation were uttered by Director Centi during his acceptance message. “I am overwhelmed with happiness today because another milestone event is about to happen. Last year in October, no less than DOLE Secretary Silvestre H. Bello III inaugurated the newly-renovated DOLE building in Tacloban City. And today, just a little later, we will be having the groundbreaking of our future West Leyte Field Office,” said Director Centi. The DOLE chief in Eastern Visayas also grabbed the chance of expressing his sincerest thanks to the good mayor of the city for the lot donation. “Of course, this will not be possible if not for the kindness of the ever active and supportive mother of this beautiful city, Mayor Cari. Madame, thank you for this great blessing for our organization. It is indeed good to know that government institutions and LGUs can together achieve success through great partnership,” Director Centi added. Records reveal that as of 28 February 2019, NMP was able to train nine hundred ninety-four (994) trainees coming from Baybay City. In line with the NMP’s effort of expanding the reach of its communication activities and to strengthen its visibility within the region, the Agency will be tapping DOLE West Leyte Field Office as delivery agent for its information materials. Meanwhile, NMP encourages seafarers to avail of the NMP-OWWA (Overseas Workers Welfare Administration) Seafarers’ Upgrading Program (SUP) and Skills for Employment Scholarship Program (SESP) which entitle the beneficiary to receive financial assistance for training costs from the OWWA.